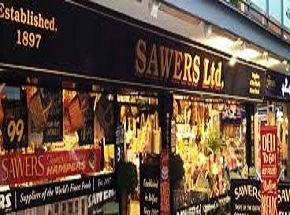 Today, Sawers continues to serve Northern Ireland the finest products from all over the world including caviar, Pata Negra Ham, foie gras, 200+ cheeses, greek olives, tapas, Italian seafood & salamis as well as gourmet hampers. Sawers has also introduced a sit-in deli with the finest fresh ingredients going into every bagel, wrap, flatbread, charcuterie board, cheeseboard and pizza. As well as searching the globe for the best cuisine we also feel it is very important to find the best local producers and showcase their quality products. We are currently working with a husband and wife team from Enniskillen and together we have created a luxurious range of branded Artisan preserves, marmalades, chutneys and fruits for cheese all worthy of the Sawers name.